American football only had two players in the top 50, the same as cricket. 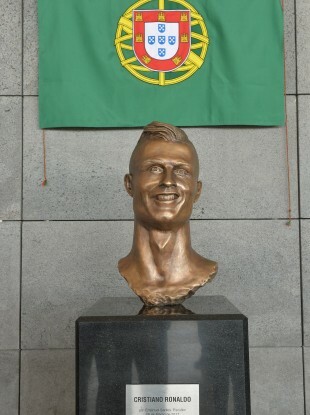 Despite the awful statues, Ronaldo is number when it comes to fame. THE NFL’S ATTEMPTS to grow American football as a global sport appears to be having little effect on fans as just two players ranked inside the top-50 of ESPN’s World Fame 100 rankings. In between back-t0-back Champions League final appearances with Real Madrid, Cristiano Ronaldo won a European Championships with Portugal so it’s little surprise he’s top of the list for the second year in a row, thanks in part to his 260 million social media followers. His nickname might be The King but LeBron James has to settle for second place while Lionel Messi’s third place ensure the top-three is as you were last year. Success at the Australian Open earlier this year bumps Roger Federer up to fourth most famous athlete in the world while, oddly, Phil Mickelson jumps eight places to round out the top-five. However, despite five international games, there are only two American football players in the top-50 — Tom Brady (21) and Cam Newton (47) — as the NFL’s belief it is growing a global game is not reflected in the minds of sports fans. In contrast, there are two cricketers in the top-15 — Virat Kohli and MS Dhoni — at 13 and 15 respectively sandwiching Ireland’s first entry on the list, Rory McIlroy. Conor McGregor is at 35, up two places from last year. Ronda Rousey is the first woman on the list at 16, while Serena Williams is also on the list at 19. All told there are only eight women in the top-100. Email “Ronaldo is the world's most famous athlete but the NFL's international efforts are failing”. Feedback on “Ronaldo is the world's most famous athlete but the NFL's international efforts are failing”.